The team delivering the new £7 million retail development in Morpeth town centre marked a major milestone in the project this week. A special topping out ceremony was held to celebrate the steel frame of the building being completed – the brand new development will create up to 100 new jobs and is transforming the former Morrisons site in the town centre. 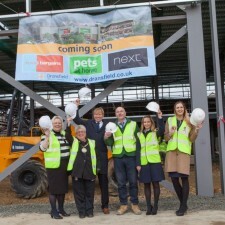 The company behind Sanderson Arcade, Dransfield Properties Ltd, is delivering the new town centre development which will bring three new retail units due to be taken by the popular national retailers; Next, Pets at Home and Home Bargains. The new 8,900 sq. 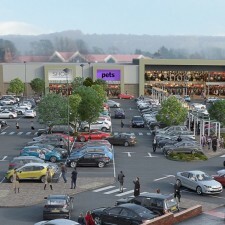 ft. Pets at Home store will also house a Grooming Parlour and Veterinary practice as well as the ground floor retail store. Next will occupy 20,000 sq. ft. over two floors and the new Home Bargains store will cover 11,162 sq. ft. 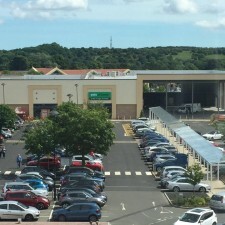 The main contractors Tolent are on schedule to complete the main building work in June with the new stores expected to open later in the summer when their fit-out teams have completed their internal works. 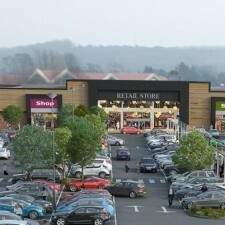 As well as redeveloping the former Morrisons site, significant improvements to the layout and location of the disabled and parent parking spaces are planned as well as the creation of a brand new glazed canopy which will run along the car park’s central walkway. The SA Taxis office is also being relocated to a brand new purpose built pod in the car park and the popular Morpeth Larder is being extended and remodelled to provide more internal space and an attractive new alfresco dining area which will be completed later this month. Managing Director of Dransfield Properties, Mark Dransfield, said: “It is fantastic to see the steel framework completed and the development really starting to take shape. Resurfacing work starts in the town centre car park on Monday and is expected to last around two weeks. The contractors will complete the work in phases to keep as many spaces open as possible while the work is on-going. Picture shows:L-R Cllr Liz Simpson, Mark Dransfield, Cllr Kath Nisbet, Medi Parry and Zoe Christopher from Sanderson Arcade with Tony Collins from Tolent.